Diplomatic communications are usually worded with great care and precision. They aren’t letters one person writes to another. They are documents which communicate specific realities and goals between states. In this case, I completely believe that Donald Trump himself wrote this letter or dictated it. In fact, I feel almost certain he did. The words resonate with a genuine hurt and anguish, mixed with moments of menace and still hope for the future. It reads needy. It’s like a letter you write to a romantic partner who has abandoned you without saying so. You write, hurt, finalizing what is already clear. We are in an era of candor and transparency. But one would hope it goes without saying that this is no way to conduct diplomacy, certainly not when nuclear weapons are at the center of it. There’s a reason diplomats do things the way they do. It can be good to have a head of state to push past some formalities. But the US never should have agreed to this summit. Indeed, President Trump’s claims notwithstanding, the North Koreans themselves didn’t seem to have suggested this at all, though they have been on the record for decades wanting such a meeting. So how did we even get here? Our best reporting suggests that the South Korean National Security Advisor was visiting the White House to consult with top US national security advisors. He was not scheduled to have an at length or substantive meeting with the President. The President switched plans and brought him into the Oval Office to talk and describe his recent meeting with Kim Jong-un. During that conversation, the South Korean mentioned that Kim was eager to meet with President Trump. Trump took this as an invitation to meet and immediately accepted. The key point is that the decision seems to have been based on impulse and to a significant degree a misunderstanding. It was clear to anyone who was really listening and who knows North Korea’s history that there was little reason to think the North Koreans were seriously considering giving up their nuclear deterrent. Indeed, why would they? They’ve made immense sacrifices to achieve it and see it – quite reasonably – as a guarantee that they will never face violent regime change from the United States or South Korea. There’s one other point worth noting. We often discuss how President Trump seems to see diplomacy in highly personal terms. Things depend on how he and the other man or woman get along personally. There’s his military, his diplomats, his cabinet secretaries. He has little sense that the US and other states may have foundational interests that trump any personal chemistry between the leaders. This letters suggests (unsurprisingly) that this feeling of personal investment is quite real, not only on the ‘positive’ side but on the negative side as well. He seems truly hurt and angry. 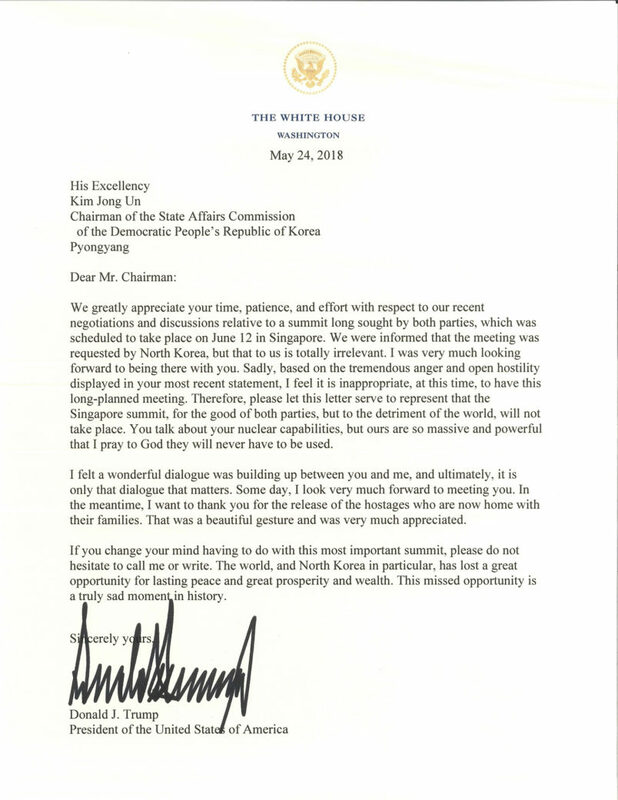 “A wonderful dialogue was building up between you and me” … “that was a beautiful gesture” … “please do not hesitate to call me or write” … “We were informed that the meeting was requested by North Korea, but that to us is totally irrelevant.” It’s not good to have a President who is this emotionally needy or one that conducts dangerous foreign policy on whims and ignorance. The entire thing is a ridiculous and embarrassing chapter in our history.